Before removing the memory card, make sure you have switched off the Dashcam, else this can lead to memory card corruption or video might go corrupt. Some of the memory cards need adapter to be inserted into card readers. First insert your memory card into adapter and then insert this adapter into the correct slot of the card reader. Be careful while doing this, there are chances of firmware corruption, if something goes wrong. Now, connect this card reader having memory card into your USB port of your PCs. Drivers on your Pc tried to identify the device and ‘Auto play’ window pops up. Click on ‘Open folder to View files’ button, then click on “DCIM” or “DSC000” folder. In case your Dashcam had Applications to play the videos, you will find a file with .exe extension, just double click on it to view your videos. If not, then you will directly get the list of videos recorded on Dash cam. Now, you can copy all videos and move them into any location of your choice on your PC. Once copied successfully, just double click on the file that you want to view. The video will be played. If you are unable to play video on PC then, follow Step 4. In case your video fails to play then, the video itself might be corrupt. Either while transferring the videos from card to PC or due to memory card errors, your Dashcam video may fail to play on PC or any device. This ensures that video is corrupt. Remo Video Repair tool will help you fix such Dashcam videos and play without any issues. Remo offers 2- different tools to repair these dashcam videos. Before proceeding with repairing the video, you need first know video type and then get the suitable tool. To do this, first copy the video to your PC as explained earlier. Now, open Windows Explorer and go to View tab -> Options -> Change folder and search options -> uncheck ‘Hide extensions for known file types’. Doing this will make all hidden file types visible; then, open File Explorer, right click on Attributes (like name, size) -> More – Here in this window, you will find various options. Select File Extension option -> click on OK. This will display the file type of the video. NOTE: You need a healthy playable video that is recorded on the same dashcam, with same codec to make the repair process easier and accurate. 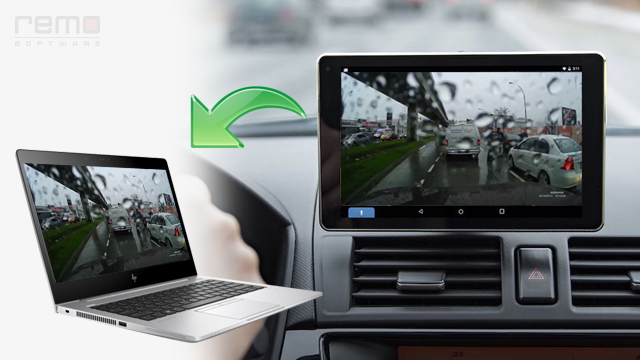 To play corrupt Dashcam video on PC download Remo Repair MOV tool, install and launch the app. On main screen, click on Corrupt File to provide the corrupt video and then click on Healthy File option to provide the healthy playable video as explained. Then click on ‘Repair’ to start the fixing process, once done you can ‘Preview’ and ‘Save’ the repaired, playable video at any location of your choice. In case, the video type is .avi, .xvid, or divx, this tool comes in handy. This tool will repair corrupt .avi files on Windows & Mac. In order to fix corrupt / not playing dashcam .avi video first download Remo Repair AVI tool, install and launch the tool. Now, click on Browse to provide the location of corrupt AVI dashcam video and then hit the ‘Repair’ button to begin the process. Once done, you can ‘Preview’ and ‘Save’ the repaired / playable video on any player. With these simple steps you can watch your Dash cam videos on your PCs. While performing these steps, make sure you have inserted the card properly and even when you are moving the videos you need to be more careful. So these, precautions lets you avoid video corruption issues and hence you can play the dashcam videos on PCs without any issues.